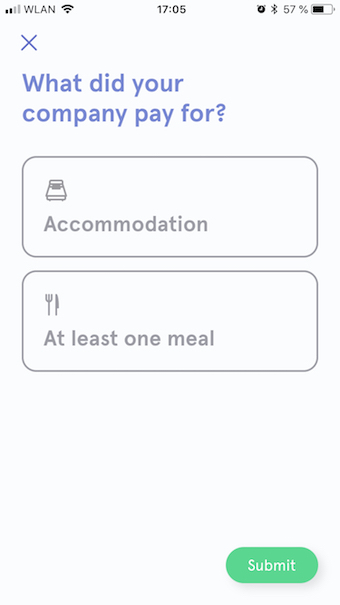 Trips allow you to group expenses belonging to the same trip and submit them together. Users can submit trip both from the mobile and web apps. As a submitter, you can create trips and add mileages and expenses to them. Once you submit them, you will be asked to fill out a few final details regarding the accommodation and meals that will allow Circula to calculate the per diem accurately. The per diem will then be displayed in the overview of your trip in the “Submissions” tab. 📝 Note: Accountants can ultimately decide whether or not the calculated per diem will be paid out. This varies depending on your company’s individual expense policy. Enter the departure and return date and time. Enter the destination of the trip. Give your trip a name. 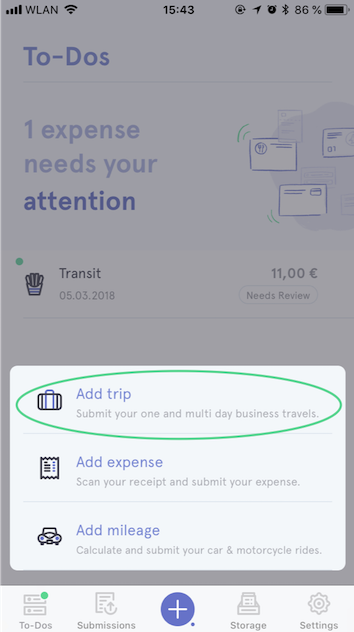 Once your trip has been created, you can add expenses to it by tapping on the green plus button on the trip’s details screen. 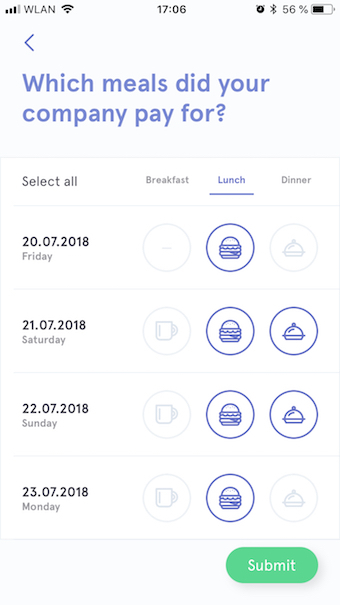 You can also add expenses that don’t belong to any trip yet to an existing one. 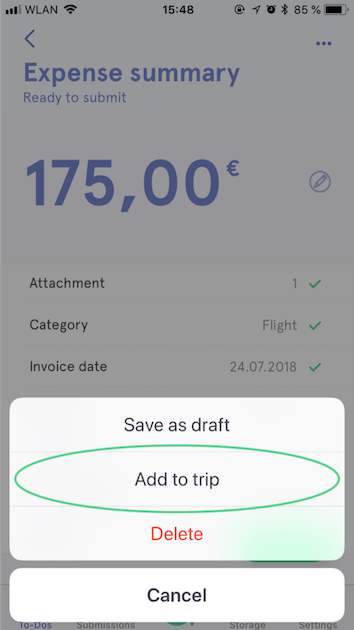 Simply select the option ‘Add to trip’ option that appears under the three dots in the upper right corner in the summary screen of an expense. ❕Important: An expense that is added to a trip in one of the aforementioned ways will be saved to a trip, and submitted only when the whole trip itself is submitted. Once the whole trip is submitted, so are all the saved expenses inside of it. Once you've added all expenses to the trip, press 'Submit trip'. The app will then ask you to provide the information required for the calculation of your per diems. After these steps, your trip will be submitted for review. In first tab To-Do’s click on the green plus button and select 'Add trip'. 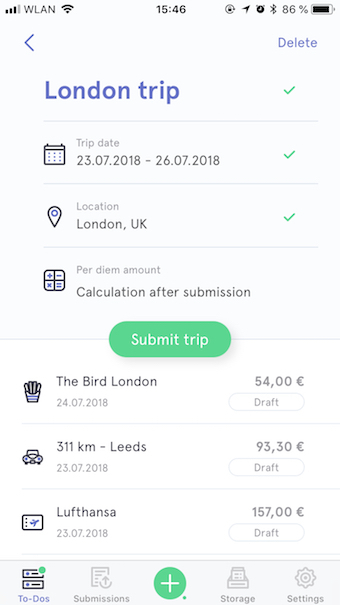 Fill in the trip details information. When all mandatory information is added, click on 'Create trip'. 📝 Note: it is possible to add multiple destinations to one single trip. To add a destination, just click on the button "add destination". Click on the trip to open the detailed view. Click on the green plus button to add expenses to it. The process is the same as for regular expenses and mileages, described in this article. When all expenses have been added, click 'Submit trip'. If applicable, per diems will be calculated upon submission. 📝 Note: Submitted expenses from a trip can be deleted as long as they weren’t controlled and approved yet.